This post will focus on migrating Domino/Notes to Exchange 2013 On-premise. 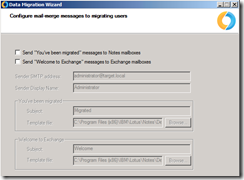 This blog post is based on Notes Migration for Exchange version 4.7.0.82. The installation is a regular next/next/finish installation. During the first startup it will ask for a license file, so provide an appropriate license and the application will start. Give the collection a name and label (label is not required). Labels can be of great help if looking for a particular batch after creating many collections. 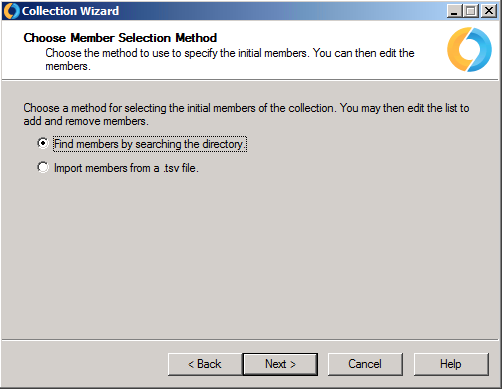 Choosing which users that should reside in the batch can be done either by finding them in the directory (i.e. NME database) or by importing them from a TSV file. In this example, I chose find them from the directory because I only select one user. In other cases the TSV import can be useful. As demonstrated below, I search for a user with a Display Name that starts with Jonas. 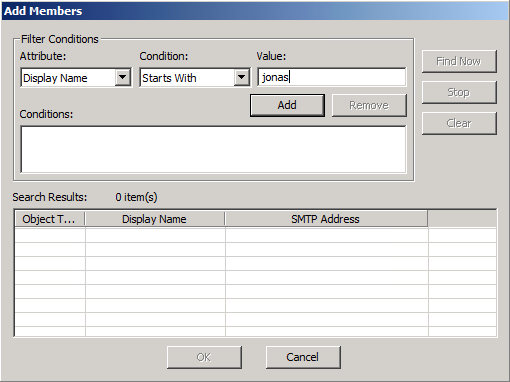 Type the desired characters in the value field, press “Add” button. You can add multiple criteria to the search filter if desired and press “Find now” when ready. The results will be shown in the search result section. Select the desired user(s) and press “OK”. The user is then added into the batch. 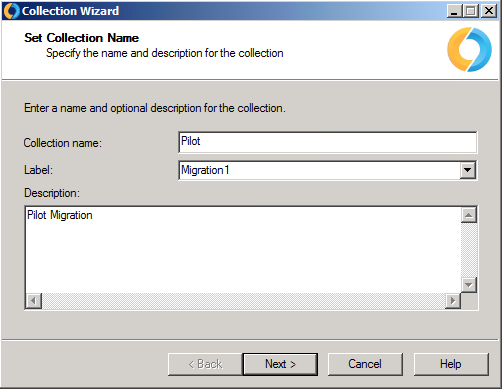 When migration batches/collections have been created we are ready to start the migration. It is basically done by switching the mailbox and migrating the contents. 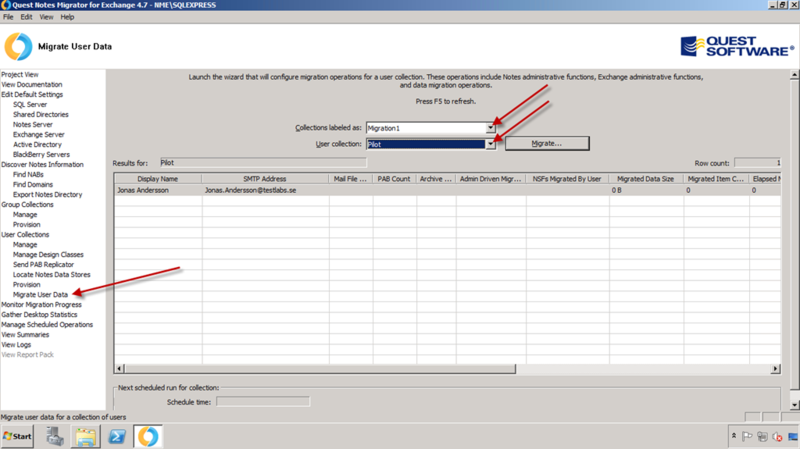 NME will configure the Domino person document with appropriate forwarding settings to ensure Domino can route email to Exchange for this specified forwarding domain. 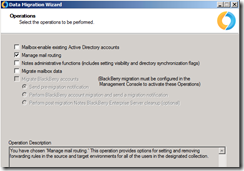 See section Notes from the field for how to configure Domino mail routing. Before any changes are made, the mailbox properties typically looks like the picture below. It has an Internet Address (same as email addresses in Exchange i.e. SMTP). Select “Manage mail routing” and press “Next”. 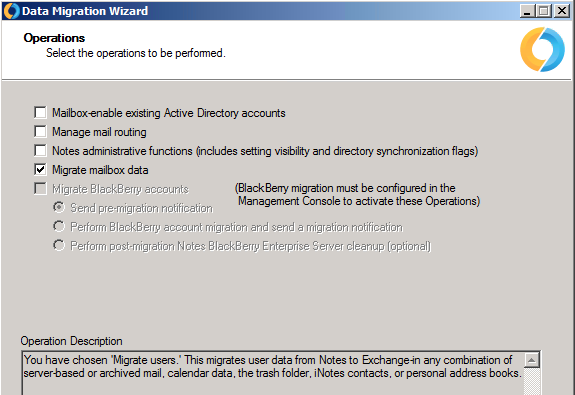 Select “Exchange” and “Quest Coexistence Manager for Notes” with “Using ActiveMail processing”. 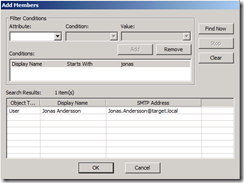 This for configuring the Domino mailbox with a forwarding address. 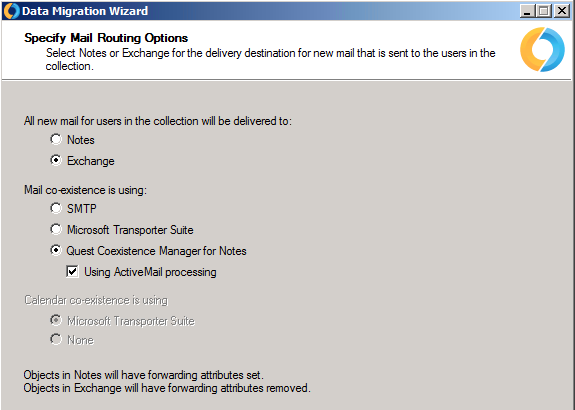 If Exchange mailboxes have forwarding/targetAddresses configured, these can be removed by using this option. 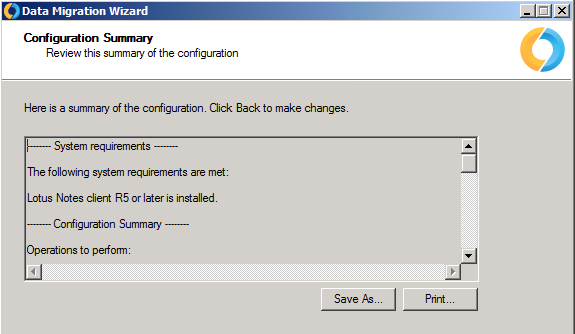 In my case I don’t have these configured, so I will let them be unchecked. Press “Next”. When switching (routing) mailboxes, with sufficient hardware, I typically run this operation with at least 20 threads (simultaneous processes). However, in this scenario it is being performed on a single mailbox, so I left it with 1 thread. Press “Next”. A summary is shown, press “Next”. The operation can be scheduled but, in my case, I want to run it now. Press “Next”. …and it was completed. Press “Exit”. 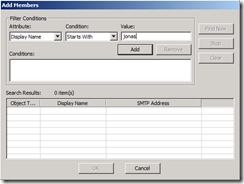 When the operation is complete, look at the user in Domino directory, it is a bit different. Note that the Forwarding address now is configured, the Mail system is configured to Other Internet Mail and Domain value is empty. Since the mail routing is completed and all new mail will route directly to the Exchange mailbox, it’s time to migrate the data. Select “Migrate mailbox data”, press “Next”. In this scenario, I didn’t use the notification options. 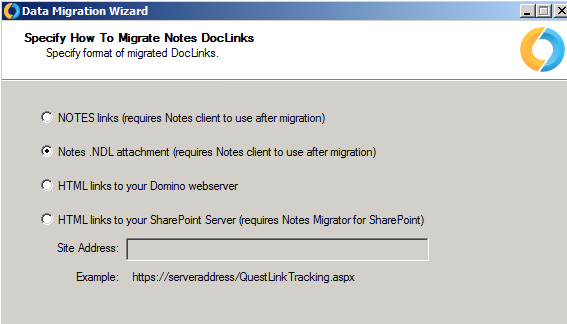 However, these can be helpful for letting users know that they are migrated and should start to use Outlook instead of Notes. Press “Next”. 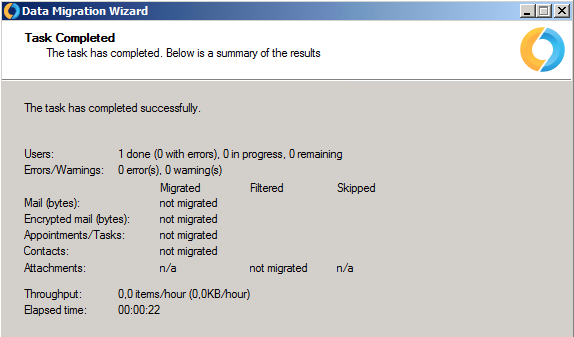 Select data types you wish to migrate, I decide to not migrate Trash and the Archive. Everything else will get migrated. Press “Next”. Select the preferred conversion method for DocLinks. 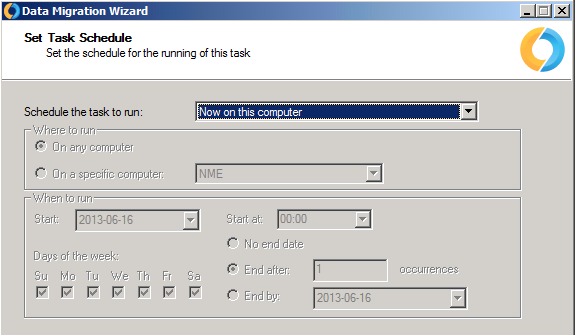 For this example, I used “Notes .NDL attachment (requires Notes client to use after migration)”. Press “Next”. Select “Through Domino server(s)”, press “Next”. Select “Server-based mailbox”, press “Next”. 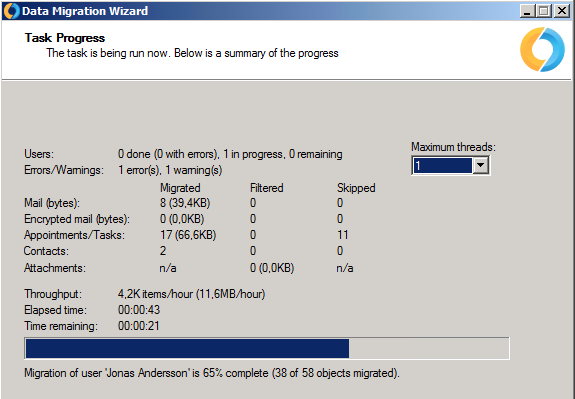 In my scenario I want to migrate everything, but the filtering options can be very useful in projects that might require to just migrate the last year’s contents and not attachments that are over 10 MB. When you have select the appropriate settings, press “Next”. When migrating mailbox data, I commonly run it with 8-12 threads (simultaneous processes). You will need to determine the setting that is best in your environment. This is normally done before or during the pilot phase of the project to ensure the most optimal configuration is ready for production migrations. In this scenario, I am migrating a single mailbox so I leave it with 1 thread. Press “Next”. I want to start the migration now. However, if that’s not the case, you have the opportunity to schedule it here. 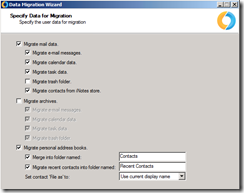 For this example, the migration throughput rates are low because we migrated a single mailbox with a small sampling of data. 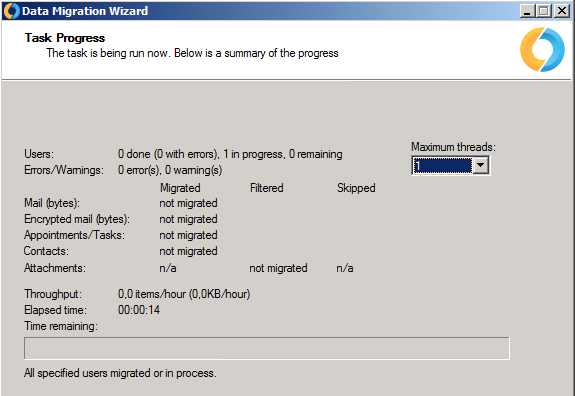 As you scale your migrations to include additional mailboxes and threads, much higher throughput rates will be achieved. 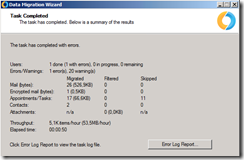 This was done in a lab environment using slow disks and small amount of memory. 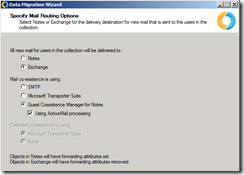 When the migration is completed, it’s a good recommendation to compare item counts and mailbox size, but you will need to account for data compression differences between Domino and Exchange. I’ve seen differences between 20-35% depending on the circumstances. 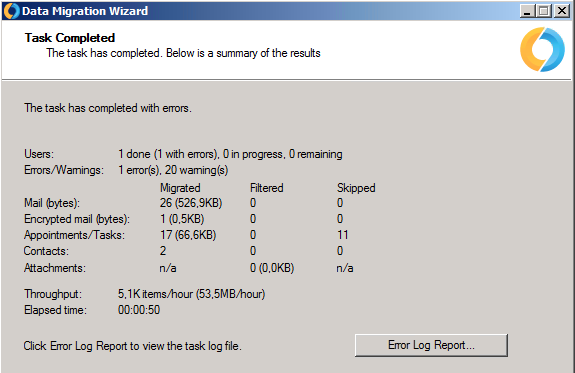 This means a Notes mail file of 1 GB may be 1,35 GB in Exchange. However, this is just a rule of thumb and needs to be estimated with actual data from each project since every customer is unique. The picture below shows that there are now 51 items and the mailbox holds 886 kb. 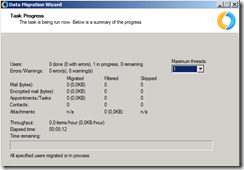 Proxy server – One thing that can be a potential issue during migrations is proxy servers. I recommend avoiding them as much as possible. If you can avoid them you will most likely save yourself some issues that might occur if a proxy server is used. These tend to block or throttle traffic, the impact can be either that the migration throughput will be very low or that it will prohibit the traffic from reaching its destination. 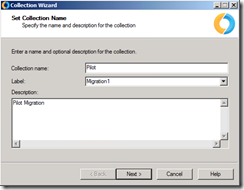 Creating batches/collections – If you are involved in larger migration projects, you likely won’t want to find each user manually. 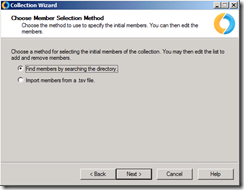 As an alternative, you can search by a Domino Directory value that is unique to each migration batch. 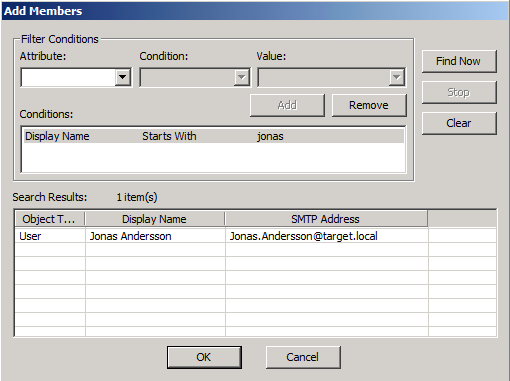 Another method for adding users to the batch is using TSV files. If you choose this approach, Excel will become your best friend. Precopy/Delta migration consideration – In cases where it’s possible, I recommend starting the migration right away after the pilot has been approved. 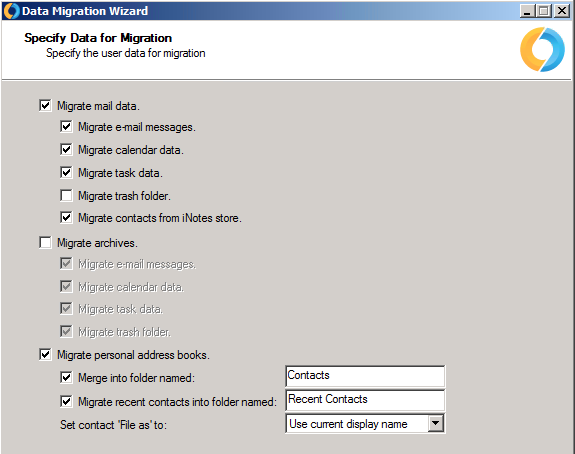 This means that the mailbox data can be migrated over/synchronized before the actual migration must take place. By pre-staging data, the mailbox switch/routing can be done fast and finally the mailbox delta data (differences) can be migrated. 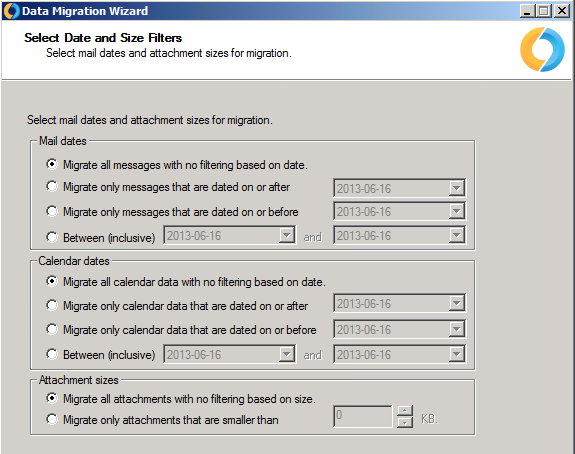 This can minimize the “migration time”. By this, I mean the time that the end-users are impacted in some way or another. One thing to keep in mind if using this method is that as soon as a mailbox is created in Exchange, the Free/Busy requests from other Exchange users sent to this newly created user won’t be sent back to Domino (where the most current data remains and action should take place). I have requested a feature from Microsoft that would make the “forwarding” of Free/Busy requests possible, but haven’t heard anything back from them yet. It would be great if that could be solved, probably easily by using targetAddress attribute together with a new attribute, for ex. forwardfbreq set to either 0 (default) or 1. Feel free to comment the post, I hope you liked the information. If you find something that might be incorrect or you have other experiences, leave a comment so it can be updated. 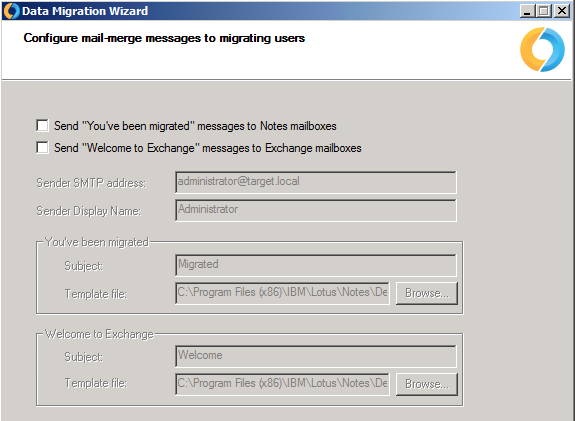 We are at the end of our Lotus to Exchange migration and we have a handful of mailboxes that have to stay on Lotus due to Lotus Script and automated process until we get it re-engineered for Exchange. 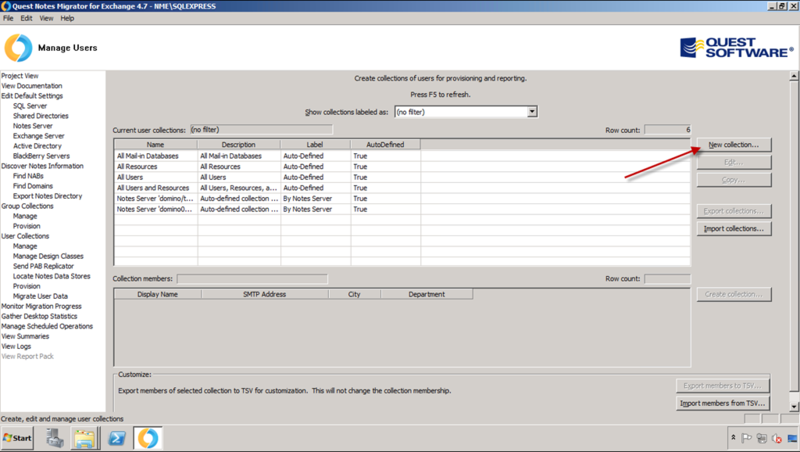 SMTP routing is through the Exchange server now, and external Emails sent to these Lotus Mailboxes have the SMTP address changed to our company’s SMTP address. Users respond to these Emails and get DNRs. 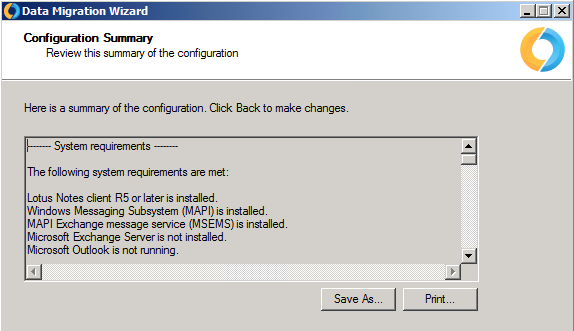 I remember this setting somewhere int he migration tool but I cannot remember exactly where to make the change. Can you guide me?